Grease and line 5-6 mini loaf pans. Preheat the oven to 300 F or 150 C.
Sift the flour, milk powder and spices t0gether. Combine dried fruits, butter, sugar, honey, orange juice and baking soda in a large saucepan. Stir over low heat until the sugar has dissolved. Bring the mixture to boil and simmer for about 5 minutes over low heat. Stir consistently. Remove the saucepan and leave to cool. Combine the eggs and gently beat it using a fork. Gently stir it into the cooled cake mixture. Fold in the sifted ingredients. Spread evenly into prepared pan and bake for about 1 hour or until cooked. Remove the cake and brush the top with brandy. Cover it tightly with aluminium foil. The cake is best eaten after a few days of aging. Pour the brandy or rum into the chopped mixed fruits and nuts. Keep it in an airtight container for 2-3 weeks before use. 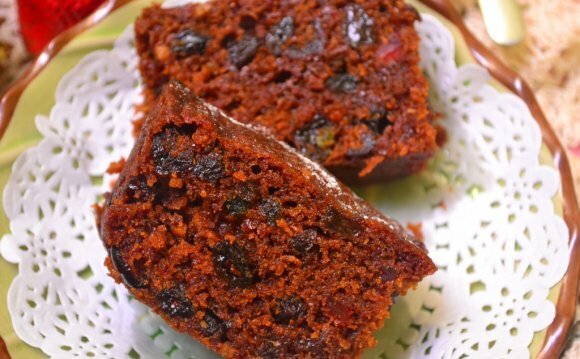 Want a moist fruit cake recipe? Check out this moist Christmas fruit cake recipe as the method calls for boiling the ingredients first before baking. A new method to try that guarantees a flavorful fruit cake that is sure to please, recipe by Siew Loon Ho.